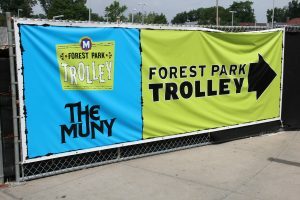 Metro transit and The Muny are partnering again this summer to offer convenient transportation to all 53 scheduled performances at The Muny in Forest Park. The #3X Muny Trolley will operate from the Forest Park-DeBaliviere MetroLink Station (trolley stop located at Pershing & DeBaliviere just north of the station) directly to The Muny at 7:22 p.m., 7:42 p.m. and 8:02 p.m. on performance nights from June 15 to August 16, 2015, beginning next Monday with My Fair Lady. After each performance, the #3X Muny Trolley will provide return trips from The Muny to the Forest Park-DeBaliviere MetroLink Station for trolley passengers. The #3X Muny Trolley will also be available immediately after performances shortened by inclement weather to provide return trips to the Forest Park-DeBaliviere MetroLink Station. Trolley riders can take advantage of more than 100 free parking spaces at the Forest Park-DeBaliviere MetroLink Station, or combine MetroLink and the #3X Muny Trolley by parking at one of 19 other free Park-Ride lots in Missouri and Illinois. Tickets to ride the #3X Muny Trolley are purchased at the time of boarding. The cost for a round-trip ticket is $2 for adults and $1 for children ages 5 to 12. All valid Metro tickets, passes and transfers, including Forest Park Trolley passes, are accepted on the Muny Trolley. For more information about the #3X Muny Trolley, visit our website or contact Transit Information at 314-231-2345 from Missouri or 618-271-2345 from Illinois.